The Iwata Power Jet Pro is twice as powerful as a Sprint Jet, so you can run two fine airbrushes or one high-flow airbrush or a small low-volume spray gun at low pressure. It has dual air regulators and gauges for setting the pressure for each airbrush independently. The Power Jet Pro has a 2 litre tank reservoir, which increases moisture separation and smoothes out the air flow. This type of machine is preferred when heavy use is expected or higher pressures required. 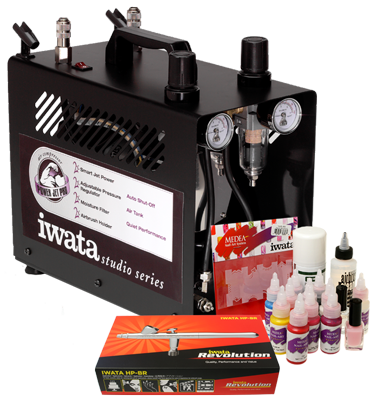 It is also suitable for running an airbrush for other beauty applications, such as tanning, body art or cosmetics. The Smart Technology automatically turns the compressor on when you press your airbrush trigger, providing instant air at the pressure you have set it, and turns the compressor off again when the airbrush is not in use. Please click here to see all other nail art kits.